When you hear a veteran band playing their way, you can feel the difference I speak between a veteran and a wannabe. That’s why I always say: do you want to play something like it was in the past? Have your own way. Have personality, what guided the old ones. 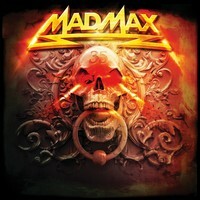 And MAD MAX, a German veteran from the beginning of the 80’s, is here with their latest album, “35”. 37 years on the road can make you change your mind or stop, but they’re still here, playing this blend between traditional Heavy Metal with Hard Rock in the German way. So, you can expect a band playing with the right amounts of musical weight, melodies and aggressiveness, and all is guided by an accessible insight (that is natural to their work). Of course, the fact that they are on the road for such time is a feature that influences a lot the way the write their songs, so be prepared. The production of “35” was done in a way that they can sound pretty heavy during all the songs, but always keeping those charming melodies comprehensible to our ears. So you’ll have the best of their work easily, without having to concentrate a lot to hear an arrangement that you want. “Running to Paradise” with its charming melodies (all of them created by their excellent guitar riffs and hooking chorus), the bitter weight shown on “Beat of the Heart” (but there are excellent arrangements created by bass guitar and drums), he excellent backing vocals and accessible harmonies of “D.A.M.N.”, the deeper and introspective “Thirty 5”, the sharp aggressive feeling that arises of “False Freedom”, and the fire spitting guitars of “Goodbye to You” can be pointed as their finest moments. Be prepared by their assault, for “35” is really a very good album.